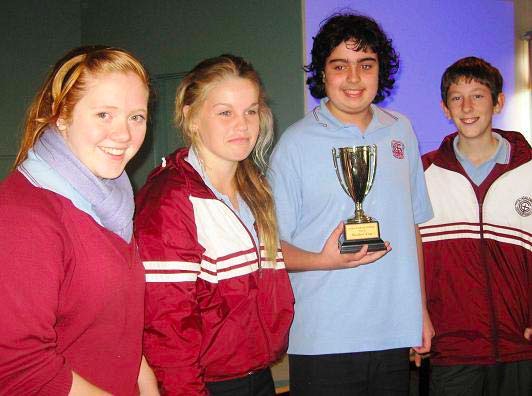 The Readers Cup competition was held in the Junior School during extended homeroom in the last fortnight. Four students from each Year 7 & 8 homeroom were asked to form a team and read 4 books. Students from each Year Level came together to answer questions about the books and present a creative piece to the audience on one novel. The most popular novel for Year 7 was Once by Morris Gleitzman with many of the teams making movies, skits and trailers about the circumstances of a young boy in Nazi Germany. The popular book in Year 8 was Homeless Bird by Gloria Whelan. This novel followed the life of 13 year old Koly who suffered an arranged marriage, lost her sick husband and became a widow wandering the streets of the city. The students entertained the audience with their interpretation of events. The Grand winners were 7.7 and 8.6. A big congratulations to all of the teams!